Get Down are proud to present Homeboy Sandman! He will be in the flying to the UK as he has been booked to attend Giles Petersons’ World Music Awards January 22nd so Get Down are extremely pleased to find out we will be bringing him to The Curve Bar Colchester Thursday 20th January! Homeboy Sandman is an artist that as been making international waves not just as an Emcee in hip-hop but in music on a world level. Tickets can be bought from Curve Bar or www.wegottickets.com for £4 from 4th January 2011, or on the door £5. Tickets : £5 in Advance or £6.50 on door. A legend of the UK hiphop scene and founder of YNR Records, Jehst touches down in Colchester with Micall Parknsun, The Working Class Dad and DJ Jazz T manning the decks. Get Down are proud to present Colchester Town’s First Ever Triple Bill of Live Hip-Hop Friday 29th October at the Curve Bar. Headlining this event is UK Hip-Hop favourite ‘Genesis Elijah‘ first known for his killer track with Klashnekoff ‘Jah Bless’and his latest Ep Civil Unrest, with support from latest champions of Pass the Mic ‘Delusionists’. Another special guest is Colchester’s very own hidden talent Bandit Blacks who will be making his premier performance at this event. Chelle shall be warming the night with a touch of jazz and Bobby Skillz will as ever be providing his party turntablism trickery throughout the night making sure the crowds are hyped for the Live Acts! 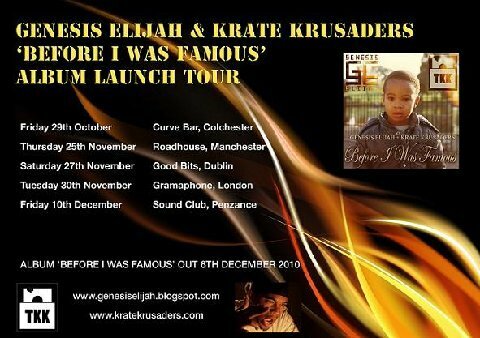 Genesis Elijah got serious in 2004 when he released “Jah Bless” featuring the one and only Klashnekoff. He then went onto release “Deh Pon Road” featuring Hip-Hop legend Skinnyman which received album of the month in Undercover magazine and gained UK Hip-Hop classic status. A year later he released the mixtape “The Industrial Revolution” which featured Sway, Dubbledge and Wordsmith which sold 20,000 copies on the streets of the UK. He has performed alongside the likes of KRS-1, GZA, Blak Twang, Big Ted & Shortee Blitz + many more recently has been touring with Atomic Hooligan internationally. Delusionists are a London-based hip hop group made up of Ben Black (vocals/production), DBF (vocals) and Slim Pickens (DJ/production). Their first official release, Prolusion Plus, was released on 3rd May 2010 via independent record label Beats Laying About. Since releasing Prolusion Plus, Delusionists have played several live dates across the UK, supporting hip hop luminaries such as Phi Life Cypher, Lewis Parker and Benji B, whilst building a reputation as energetic, charismatic performers. Delusionists are currently working on an EP of new material, as well as side projects and collaborations with other artists. You are currently browsing the archives for the Colchester category.